"Did you, by chance, open the book?" XLrator Media has debuted the first official trailer for an interesting genre mashup titled Residue, a neo-noir thriller mixed with supernatural horror. The story follows a private investigator who reads a book of sinister origins owned by seedy crime lord. This (think Evil Dead) puts his daughter and himself in a fight for their lives, and their eternal souls. 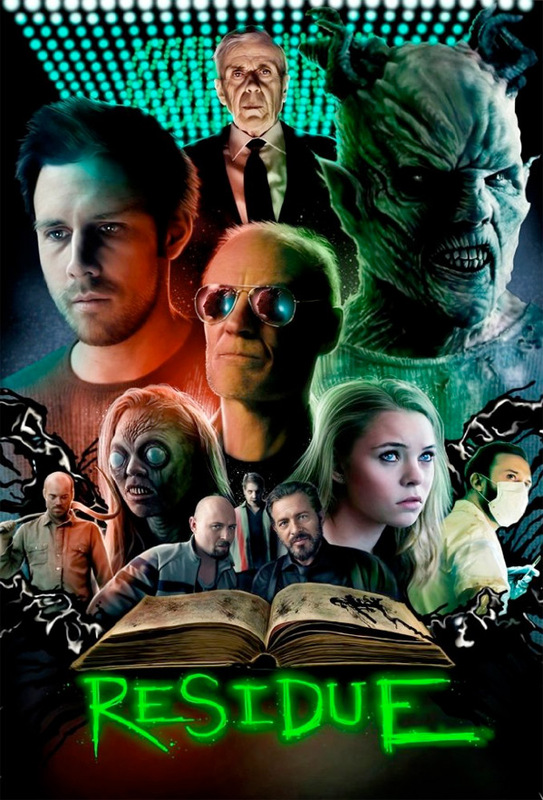 Starring James Clayton as Luke Harding, as well as Matt Frewer, Michael Matic, Costas Mandylor, Alika Autran, Dan Payne, William B. Davis, Elysia Rotaru, and Taylor Hickson as his daughter Angelina. This is a very weird trailer with tons of crazy things going on. I can't even make sense of it. The big reveals don't come until the final few seconds; beyond that, it's a mess of footage and glimpses and wacky things happening. Take a look. Private investigator Luke Harding (James Clayton) reads a book of sinister origins owned by seedy crime lord Mr. Fairweather (Matt Frewer). Unbeknownst to Luke, the book is a much sought after supernatural artifact and Fairweather's greatest rival, the enigmatic Mr. Lamont (William B. Davis), begins pursuit of Luke with his trustiest henchmen Boston (Michael Matic) & Jacob (Costas Mandylor). While the criminal underworld is desperate to retrieve the book and harness its power for their own dark agendas, it's evil begins to take root in Luke's apartment; pitting himself, his daughter and his secret love Monica in a fight for their lives… and their eternal souls. Residue is both written and directed by filmmaker Rusty Nixon, of the films Candiland and Down the Line previously. This is premiering at the Sunscreen Film Festival this month. XLrator Media will then release Residue in select theaters starting July 18th this summer. Anyone?